Description of "Practice Set Measures of Central tendency and Measures of dispersion (eBook)"
This practice set has 75 multiple choice questions with answer key. Question are designed in such a way that they help to clear the concept of central tendency and measure of dispersion. All question are based on measure of central tendency(Mean, Median, Mode) and Measure of dispersion (Range, Quartile deviation , mean deviation , Standard deviation, and coefficient of variation). The practice set is very useful for the students of MBA, BBA, and other working professional who are analyzing the data variation in manufacturing and service industry. 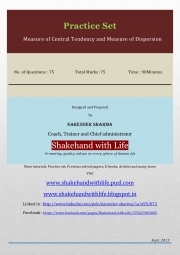 Hi, This is Narender Sharma, facilitating Corporate training and Management education. This coursework helps in easy understanding of the concepts and scoring good grades in your examination. Electronics Bazaar, June 2014 by EFY Enterprises Pvt. Ltd.
Electronics For You, February 2015 by EFY Enterprises Pvt. Ltd. Reviews of "Practice Set Measures of Central tendency and Measures of dispersion (eBook)"